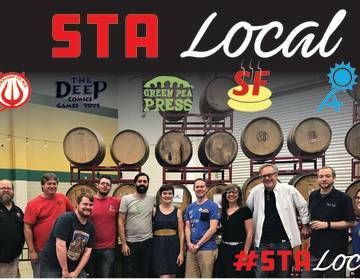 Straight to Ale is proud to announce our #STAlocal campaign kicking off Summer 2018. The goal is simple – work with local community organizations and artists outside of the brewing industry to come together and create a brand-new beer. Collaboration and community are at the heart of Straight to Ale, and we are looking forward to bringing people who inspire us into the brewery and sharing in our passion of brewing great beer. Organizations participating in this inaugural brew are Green Pea Press, Energy Alabama, The Deep, and Startlingly Fresh Records. Representatives from each will come together and work out every step of the brewing process with the team at Straight to Ale. From selecting a style, approving a recipe, finding a name, and of course coming together on brew day to make it all happen, we’re crafting something completely new while working with our community to create new connections. We’ll then throw a release party at the Straight to Ale Taproom to celebrate the project and toast to the new connections made (date TBD). After our first project meeting sampling many styles and discussing our favorite flavor profiles, we decided we’ll brew a Belgian Wit Beer, but will cut back the orange peel that is typically used and use more lemon peel and/or lemongrass. Once fermentation is near complete, we might do a light dry hopping with a tropical hop. For more information on the project, please feel free to contact Kimberly@straighttoale.com.